Deputy Defense Minister Anatoly Antonov: Countries will practice "joint participation in peacekeeping operations, as well as counter-terrorism and anti-piracy actions." 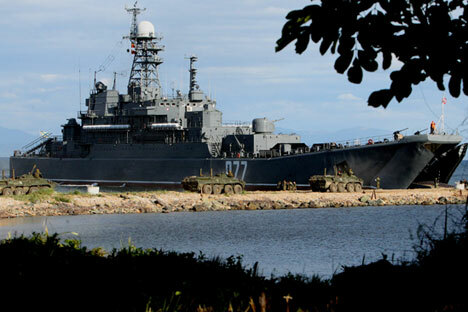 Russia and China are to carry out joint naval exercises in the Pacific in August. The military cooperation between Russia and China is aimed at increasing mutual resistance to new threats and challenges, Deputy Defense Minister Anatoly Antonov said on May 11, following talks between Defense Minister Sergei Shoigu and Central Military Commission Vice Chairman Fan Changlong. "In May and August of this year, two Russian-Chinese naval exercises are planned to be carried out in the waters of the Mediterranean and the Sea of Japan," said Antonov. The countries will practice "joint participation in peacekeeping operations, as well as counter-terrorism and anti-piracy actions" in course of the exercises in the Sea of Japan, he said.